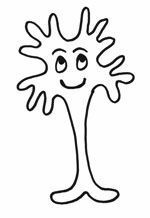 As you may already know, the word “neuron” is a label for specialized cells in your brain and nervous system (and in your heart as well, for that matter) that have a highly developed ability to exchange information with each other. Most humans call that “thinking. Estimates are that you have 100 billion neurons in your brain, give or take a few billion. Some even say you have more neurons than there are stars in our galaxy! Imagine your hand is a neuron. The palm of your hand represents the cell body (or face, if you will). Your thumb represents the axon or largest projection. Think of it as the door out of the neuron. 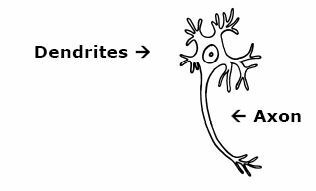 Your fingers represent dendrites, smaller projections whose job is to collect information and bring it inside the cell so it can be processed (e.g., you can think about it). In order for you to think, neurons have to exchange information with each other, but they don’t actually physically touch each other to do this. One of the ways in which they exchange information is by means of a synapse. A bit of chemical information is released from the terminal at the end of an axon. This chemical information is picked up by tiny boats (neurotransmitters) if you will, and ferried across the tiny canal (synaptic gap). On the other side of the canal it is picked up by the dendrite of another neuron. The tiny boats return to dock at the axon terminal, ready to be used again as needed. The communication possibilities are virtually unlimited! Researchers have estimated that there may be more synaptic connections in your brain than there are atoms in our universe! How’s that for potential? Neurons function much in the same way as muscle tissue. Neurons tend to get stronger with mental exercise. In fact, the more they are challenged and stimulated the stronger they become and the further they stretch. This shortens the distance across the synaptic gap (or canal). Of course the reverse is true. Neurons tend to shrivel up and atrophy with disuse. This can be the basis for some age-related memory problems or other “thinking” dysfunction. Some of these problems can even be reversed for a time with increased brain stimulation. NOTE: You may want to solve Brain Benders as one type of Brain Aerobic Exercise to help keep your neuronal dendrites and axons stretched out. See Heart (below) for additional information. Neurons may represent the most diverse type of cell in the body. Within the three classes of neurons are hundreds of different types, each with specific message-carrying abilities. The way in which these neurons communicate with each other by making connections is what makes each of us unique in how we think, and feel, and act. Sensory neurons carry information from the sense organs (such as the eyes and ears) to the brain. Motor neurons have long axons and carry information from the central nervous system to the muscles and glands of the body. Alzheimer’s disease, unusual proteins build up in and around neurons in the neocortex and hippocampus, parts of the brain that control memory. When these neurons die, people lose their capacity to remember and their ability to do everyday tasks. Physical damage to the brain and other parts of the central nervous system can also kill or disable neurons. Blows to the brain, or the damage caused by a stroke, can kill neurons outright or slowly starve them of the oxygen and nutrients they need to survive. Huntington’s disease, a genetic mutation causes over-production of a neurotransmitter called glutamate, which kills neurons in the basal ganglia. As a result, people twist and writhe uncontrollably. Parkinson’s disease, neurons that produce the neurotransmitter dopamine die off in the basal ganglia, an area of the brain that controls body movements. The brain can no longer control the body and people shake and jerk in spasms. Spinal cord injury can disrupt communication between the brain and muscles when neurons lose their connection to axons located below the site of injury. These neurons may still live, but they lose their ability to communicate. Refer to Nutrition and the Brain for more information. Some neurons migrate by following the long fibers of cells called radial glia. These fibers extend from the inner layers to the outer layers of the brain. Neurons glide along the fibers until they reach their destination. Neurons also travel by using chemical signals. Scientists have found special molecules on the surface of neurons—adhesion molecules—that bind with similar molecules on nearby glial cells or nerve axons. These chemical signals guide the neuron to its final location. Mirror neurons are a type of brain cell that respond equally when we perform an action and when we witness someone else perform the same action. They were first discovered in the early 1990s, when a team of Italian researchers found individual neurons in the brains of macaque monkeys that fired both when the monkeys grabbed an object and also when the monkeys watched another primate grab the same object. Nerve Growth Factor (NGF) was the first neurotrophin discovered, almost 50 years ago, at Washington University in St. Louis. It was found to not only keep certain types of nerve cells alive but cause them to sprout new branches. (Katz, Lawrence C., PhD and Manning Rubin. Keep Your Brain Alive. p 141. NY: Workman Publishing Company, Inc., 1999. We have roughly 86 billion neurons in our brains.But unlike the common saying, we don’t just use 10% of them; we use most of them all of the time! Purves, Dale, George J. Augustine, David Fitzpatrick, William C. Hall, Anthony-Samuel LaMantia, James O. McNamara, and Leonard E. White (2008). Neuroscience. 4th ed.. Sinauer Associates. pp. 432–4. Refer to Neuropeptides for additional information. Refer to Sexual Orientation and the Brain for more information. Refer to Sexuality and the Human Brain for more information.